Substratum COO and co-founder B.J. Allmon, left, and Chief Tech Officer Steve Swing, right, work inside the Substratum office at 23 N. Union St. in downtown Delaware. The company focuses on creating a decentralized web and building products and services centered around cryptocurrency transactions. 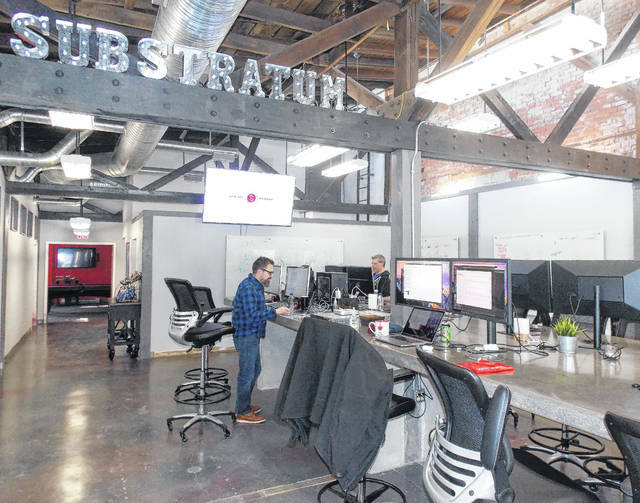 The City of Delaware has welcomed rapidly growing software company Substratum to the downtown business community. The company was established solely through crowdfunding cryptocurrency from investors all over the world and officially began working in September 2017. Substratum has two initiatives: to create a decentralized web and to build products and services that help promote the transactions of cryptocurrency. The team hit the ground running and performed their first alpha test with their investors. They are on track to perform their second alpha test this month. Although the timing of the company is coming at a time when net neutrality is a more frequent talking point in the U.S., it’s been an issue for a lot of their international investors from Belgium, Austria, and China for years. “(Net neutrality) is a hot button topic right now, and we’re one of the only solutions out there. We’re proposing a different way to use the internet,” said BJ Allmon, COO and co-founder. Allmon and fellow co-founder and CIO Abram Cookson chose Delaware because of accessibility: the accessibility of a flexible, large building; accessibility to masons, electricians, and city staff to get the renovations finished in a timely manner; and the accessibility of labor. “We have the accessibility of people from a Columbus perspective (for labor) from a scope of our size, but we have a small town, small business-feel being here,” Cookson said. Sean Hughes, city economic development director, confirmed that Delaware is seeing a large boost in office leads looking to Delaware’s downtown core for opening, relocating, or expanding their businesses. “The recent City of Delaware resident attitudes survey found that residents want more white-collar jobs in the city. Our work in redeveloping the downtown into a place where people want to be has helped the city to become more attractive to technology, engineering, and marketing firms. The employees of these types of companies desire walkability to restaurants, coffee shops, and entertainment,” Hughes said. Hughes also learned through extensive research that the city’s resident labor force dramatically changed, requiring doing economic development differently than the city had in the past. Having the company in a smaller community like Delaware puts Substratum’s vision into perspective for Allmon. Their mission not only affects people in metropolitan areas, but also towns, villages, townships, and small cities. Kelsey Scott is an economic development specialist for the City of Delaware. She can be reached at kscott@delawareohio.net.